I started seeing American Flag patterned shorts EVERYWHERE and I loved them! So my sister and I had a crafting night to try to make our own, and I am pretty happy with how they turned out! Best part is, they only cost me under $10. All you need is white and red fabric paint (which you can find at any craft store), painter’s tape, a pair of old shorts. 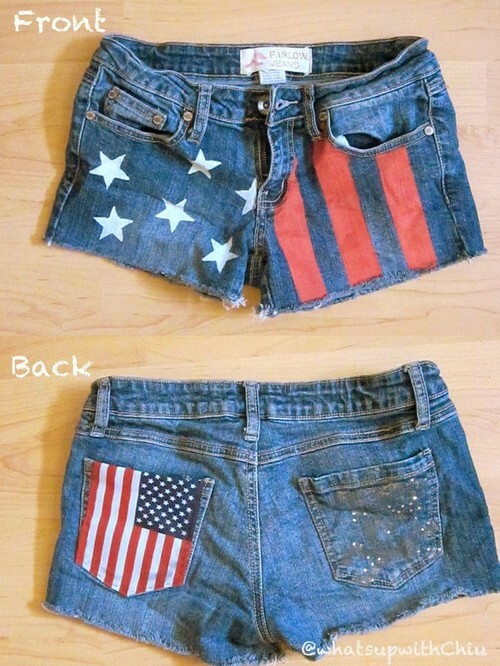 If you want to go super DIY, you can even take an old pair of jeans and cut them to shorts. On one side of the shorts, use painter’s tape to tape down the edges of your stripes. I made my stripes vertical (because it was easier and I’m lazy). I just eye-balled the widths of my stripes, but you can use a ruler to measure the widths of the stripes to make them more even. If you happen to have a stencil of a star shape, then you’re a step ahead! If not, you can make one by just cutting out the shape from a piece of paper. I used printer paper and free handed a star shape using a pencil, then cut out my star outline. However, I suggest using thicker paper, like a manila folder, because the paint started to make my paper stencil soggy and it eventually ripped. Once you have your stencil, use your white paint, paint brush, and star stencil to paint starts all around. You can paint as many or as little – however many you want! Try to position your stars at random. Now just let your shorts air-dry overnight and you’re done! I really wanted to add something to the back of shorts, so I bought a small-sized american flag from the Dollar Store (they are meant for desk decors), and used fabric glue to secure it onto the back pocket of shorts.